The Pearson Lab, part of the Department of Earth and Planetary Sciences (EPS), is an approximately 2,900 sq. ft. lab on the ground floor of the Hoffman Building located at 24 Oxford Street in Cambridge, Massachusetts. The project is a complete renovation of an existing lab space to accommodate the specific needs of Ann Pearson, a newly tenured professor, and her lab group. Professor Pearson directs the Laboratory for Molecular Biogeochemistry and Organic Geochemistry. Recent research in the Pearson Lab focuses on understanding the origins of important environmental and taxonomic lipid molecular fossils. 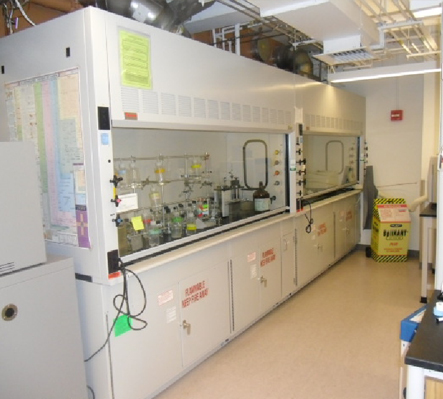 To support Professor Pearson’s research activities, 3 variable air volume (VAV) chemical fume hoods were installed that significantly reduce exhaust rates when the sashes are closed. In addition, these hoods are be able to run at a face velocity of 80 feet per minute instead of 100 feet per minute – reducing airflow by 20% and conserving the energy that would have been required to condition that air. The lighting design meets the researchers’ requirements without exceeding recommended lighting power limits. The design incorporates energy efficient fixtures and task lights, which leads to a 25% reduction in the lighting power density below code standards. Throughout the entire space, DDC thermostatic sensors tie into the building’s control system, allowing temperature settings to be set back whenever those spaces are unoccupied.